So, this has been kicking around for months for no good reason, except I am finding it hard to find the time to sit down at the computer, but, anyway, it's done. I released a quilting pattern into the wild! It's free on Craftsy, and you can download it here. It was inspired by some clever piecing from Lori Holt's book Quilty Fun, which is really all about clever piecing, and if you don't have it, you should buy it. After that I was all, whoa, about it, then thought, couldn't that be expanded... to something like Antique Tile! And it works with charm packs to make 12" finished blocks. You guys know I love Antique Tile. I've only made... (I don't even know) a half dozen (?) projects with it. It's simple and versatile and looks awesome. I was hashing this process out at last year's Ann Arbor MQG retreat, so now that it's been almost a year, I should get this done. Especially since my example quilts and my pattern tester's blocks were all finished months and months ago! And thank you to all my testers! Your advice was really helpful! This is a couch quilt, it used 4 charm packs (I started with two and quickly realized my error, and had to order two more!) It's 5 feet square, counting a 6" border. The line is Barcelona by Zen Chic! Each block takes 9 charms, most charm packs have 42 charms, so, for every 4 blocks you want to make, you need one more charm pack. This is a table runner I made using Tula Pink Saltwater fabrics and a solid with this method. It took only a little bit more thinking to get the blocks so the sea horses were still right side up. 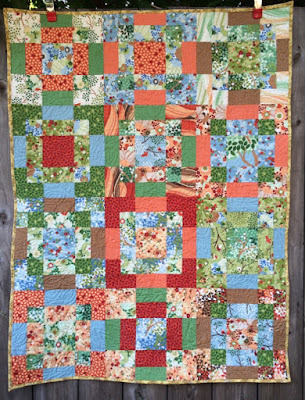 The quilting is a Leah Day design, Matrix, though her's is lovely and neat and mine is comparatively messy. But it gives a good oceany texture. The last thing I made with this pattern is a crib quilt, 3'x4' and this was donated to charity. 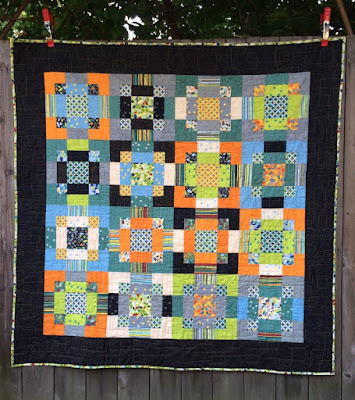 The quilting is an all over leaf design a la Angela Walter's first book. 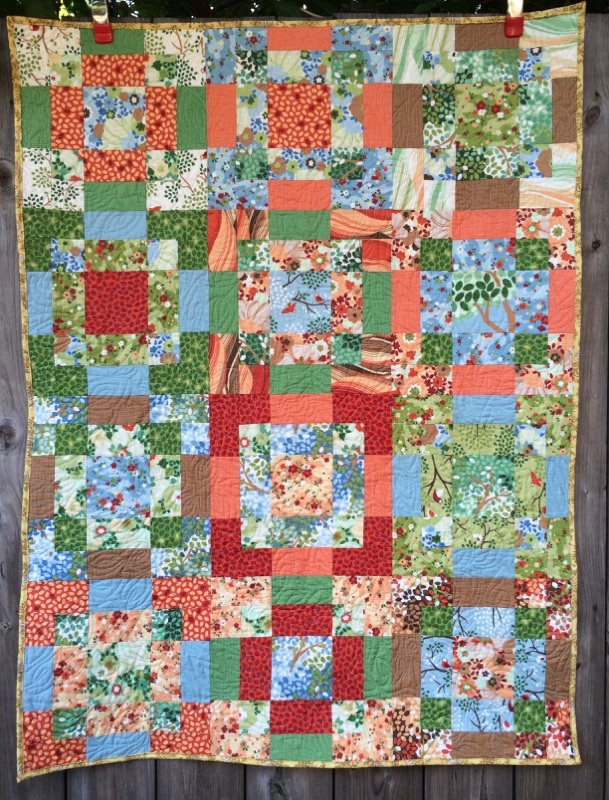 It uses Chirp Chirp by MoMo, whom I love, but I'm not sure I love this line, many of the fabrics are really cute, but I think visually, there is some problem in this quilt, I hardly know what I am looking at and I made it, but hopefully, someone will love it! The pattern I wrote includes illustrated instructions, a coloring sheet, a table about the different projects you can make, and a separate page of instructions about making a two color antique tile quilt, and more about that in another post. Anyway, please, download the pattern (and it's free, so why not?) and tell me what you think!